Ground Resistance Testing and Step and Touch Calculations - Vancouver Industrial Electric Ltd. It states in Section 36-304 of the Canadian Electrical Code that the station ground resistance for a high voltage installation be measured. This resistance is the connection of the ground electrode system to the earth. The connection must be low enough under the maximum fault current to comply with Table 52 for tolerable step and touch voltages. Our field service technicians will perform soil resistivity measurements and collect soil samples for analysis before the electrode system is designed and installed. 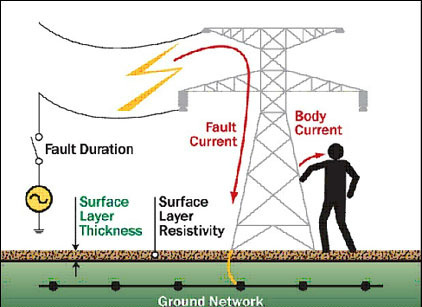 With this information, our engineering support can design a ground electrode system that will provide adequate safety under fault current conditions.